Now, before you reach for those pitchforks, let me say that the words in the title aren’t mine or one of my colleagues’ at SamMobile. They come straight from Samsung, or at least from the company’s Samsung Members app, from a section on official performance tips for the Galaxy Note 8. And, frankly, if we consider what happened last year, Samsung isn’t entirely wrong, but it’s not entirely correct, either. The Galaxy Note 7 had a 3,500 mAh battery, but that phone was officially cancelled after its tendency to burn up was found to be the norm rather than an exception. The Galaxy Note 8, therefore, does have the largest battery on any Galaxy Note flagship that didn’t meet a premature end. But, I’m not sure it has the most generous battery capacity of any Note device. That statement would be 100 percent correct if the Note 8’s battery capacity were notably higher than any Note flagship before it, but that’s not true. The Galaxy Note 4 had a 3,220 mAh battery, way before the Note 7 fiasco and just a year before Samsung decided Europeans aren’t productive enough to need a Galaxy Note smartphone. Only 80 mAh lower than the Note 8, if you do the math. While Samsung probably wants to forget what is possibly its worst supported flagship ever, we still remember it all. The Note 4’s battery was big for its time, and it was removable, too. Sure, the Note 8 has fast wired and fast wireless charging and will also retain much of its charge holding capacity a year or two down the line. But it’s far from the “most generous” as Samsung puts it, and doesn’t have anything on the fact that Note 4 users could swap their battery for a new one whenever they felt like it (and had support for the same wired fast charging tech back then). A removable battery wouldn’t have allowed Samsung to give us the beautiful smartphone designs it has in recent years, though, so every aspect has both a pro and con associated with it. Thankfully, while the Note 8 doesn’t have the most generous battery capacity of any Note device, it manages to offer surprisingly impressive endurance (even surpassing the S8+ at times, at least for me). 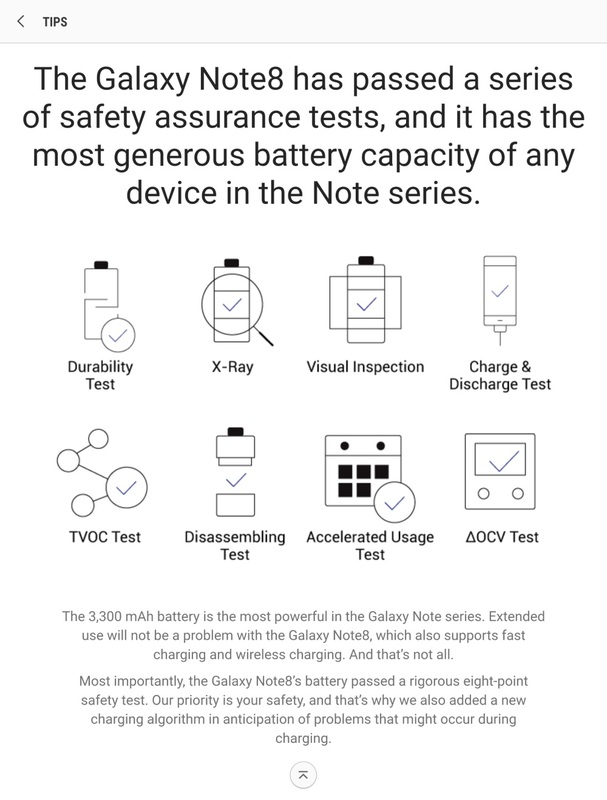 Along with the S8 and S8+, the Note 8 also has the safest battery on any Samsung smartphone or tablet, or at least one that has gone through a battery of checks (pun unintended) to ensure there’s no repeat of the Note 7 drama. And, well, Samsung doesn’t seem to be using this marketing ploy everywhere, so I guess we can excuse the company for taking a few liberties with its words. Disclaimer: This article isn’t meant to deride Samsung; this is just something we thought would make for interesting reading for our readers. Seriously, still going on about the removable battery?! “you can swap it out whenever you like”. That’s very true, but you’re forgetting that if its not charged you’re screwed! So you will have to fully charge both batteries – separately, I add because I have not seen any accessories that charge a battery without being in a device. so while you’re waiting that extra two hours to make use of this dated endurance method, I’ll happily just plug my phone into a battery pack for 15 mins for battery boost. There was an external battery charger for the Note 4 battery. I’m not sure if it came with an extra power supply though. My Note 8, with heavy use, requires probably a 6,600 mAh battery for a 1 day use. Battery lasts me a day and a quarter on WiFi but when I’m traveling with mobile data and location services on then it’s a different story.